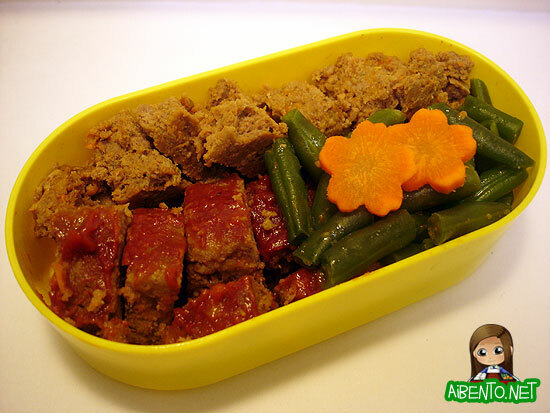 Last night we had meat loaf and though it is a bit hard to arrange nicely in a bento, it tastes really really good. Still, it’s not nearly as good as my ingenius title pun. Right? I hope you get it, though it helps to have been into 90s music. Next to it there are green beans with sakura carrots. I’m almost done eating this durned kim chee fried rice of mine. Next time I know not to make so much at once! I’ve got one last serving in the fridge but maybe I should just chuck it. 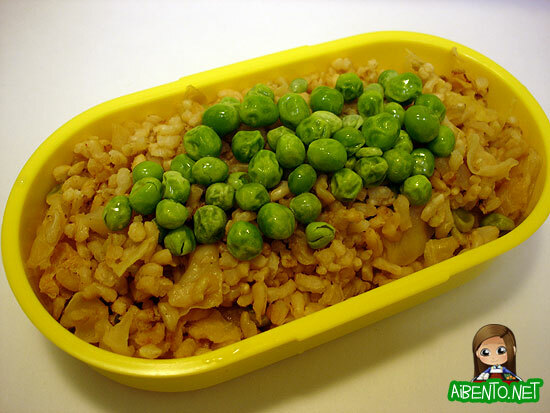 Mr. Pikko saw me putting it into the box and went “Ewe.” It looked really pale so I added some green peas to the top, though they were pretty badly freezer burned. As I’ve said in the past though, I’m a food optimist. They can’t be all that bad. The yellowish light is really starting to tick me off, if anyone can advise me on what kind of light I should buy, please let me know. I’ve officially caught the family cold, dang it. Tomorrow I’ll probably do a salad and miso soup with somen lunch to keep it light.